Welcome To Macon Custom Trailers! Call Us for Your Next Trailer or Golf Cart! Click Here to Call John Today! 2017 EZ_GO RXV 4 Seater, New Electric Blue Body is Fantastic! Lights, Blinkers, Horn! Livestock Trailer, 6.5ft Tall, 6ft Wide X 16ft Long by Bee Trailers. Larger 225/15" Radials! 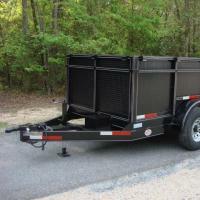 8.5ft X 16ft Tandem Enclosed Cargo Trailer, 5K lb Axles, 7ft 4in Tall, Black Out Pkg. 2016 Club Car Precedent 48v Electric, 4 Seater, Long Top, LED Lights, Like New! EZ-GO Golf Cart, RXV, New Red Body, Fast 48v Electric, Flip Rear Seat, New 10" Alloy's are Taller!! 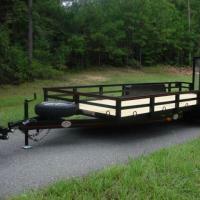 Deluxe Utility & Landscape Trailer Tandem Axle 6.5ft X 14ft, Includes the Beavertail! 2015 EZ-GO RXV, Fast 48v Electric 4 Seater in Almond Pearl, Long Top, All LED Lights/Blinkers/Horn, Loaded! 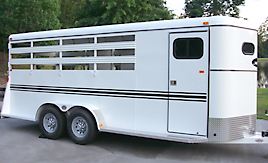 Bee 2 Horse Slant Warmblood Dressing Room Trailer 6ft 8" Wide X 14ft Long, 2 Drop Down Windows, Escape Door! 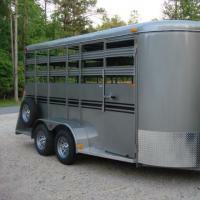 Bee 6ft X 16ft Up-Graded Livestock Trailer, 6.5ft Tall, Huge Front TackRoom with Escape Door! Enclosed Cargo Trailer 7ft X 14ft Deluxe, in Charcoal & Black Out Pkg. 2017 EZ-GO RXV Fast 48v Electric 4 Seater is Absolutely Stunning! Large Lift Kit with New 14" Alloy's! 2018 EZ-GO RXV 2 Plus 2 Shuttle Golf Cart, from the Augusta Masters! Lights, Horn, Mirror, etc. Utility & Landscape, Tubing Rails & Posts, 6.5ft X 18ft Tandem! 2 Horse Slant Gooseneck with Huge Dressing Room! Not In Stock! Mini Size Horse & Livestock Trailer 5ft X 12ft, Haul Calves, Goats, Pigs, Sheep, Ponies! 6ft X 14ft Fully Enclosed 2 Horse Slant w/Larger Dressing Room! New! Flatbed & Equipment or Car Trailer, 3.5 Ton 7ft X 20ft Tandem, 6" Channel Iron frame, Loaded! 8.5ft X 21ft Deckover 7 Ton Flatbed Trailer, Huge Full Width Cat Walk Ramps! Enclosed Cargo Trailer 6ft X 12ft in Charcoal, 7ft 4in Tall Inside, Ramp Door, 16" Centered Walls/Roof/Floors! 7ft X 16ft Deluxe Freedom Enclosed Cargo Trailer, 6ft 8" Tall Inside, Charcoal Gray with Black Out Pkg! 2015 EZ-GO TXT All Terrain 4 Seater, 14" Alloy's, Long Top, 48v Electric! 2 Horse Straight Load w/Side Ramp, Dressing Room Trailer in Aluminum! 2017 EZ-GO RXV Fast 48v Electric 4 Seater, White & Tan Long Top, 09/16 Trojan's! Utility & Landscape Trailer 7ft X 16ft w/Landscape Box, 2 Brake Axles! 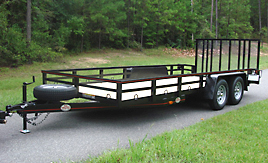 Awesome 7ft X 12ft Tandem Enclosed Freedom Cargo Trailer in Charcoal & Black-Out Pkg. 6ft 8" X 16ft Aluminum 2 Horse Trailer w/Huge Dressing Room, Insulated Ceiling! 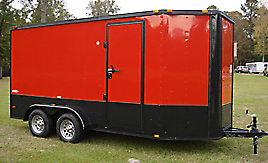 Awesome 5ft X 10ft Utility Trailer, 12" Tall Steel Sides, 15" Wheels, 4ft Ramp! Haul Dirt, Gravel, etc. Like New Demo 4 Seater EZ-GO TXT 13HP Gas Cart! Sold! Flatbed & Equipment Trailer 3.5 Ton 7ft X 20ft Call for Current Price! 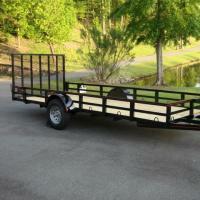 Deluxe 6ft X 14ft Utility Trailer W/24" Mesh Sides, Beavertail, Spare Holder & D Rings! 7ft X 20ft Flatbed 7 Ton BobCat Trailer, 8" Channel Iron Frame, 7K lb Axles! Heavy Duty! We are open Monday through Saturday from 9:00 am to 6:00 pm, meaning you’ll never have to wait long for a new enclosed Cargo Trailer in the Atlanta, GA Area. Since 2004, Macon Custom Trailers and Golf Carts has been the leading source for Trailers and Golf Carts in the Atlanta, GA Area. We are a locally owned and operated small business, South of Atlanta, GA. We have been serving our Southeast Customers since 2004. Our retail team is friendly and knowledgeable, and are known for being helpful and accommodating. Since 2004, Macon Custom Trailers and Golf Carts has been the leading source for Trailers and Golf Carts in the Atlanta, Ga Area. We are a proud locally owned and operated small business, and all of our products are made in the USA. 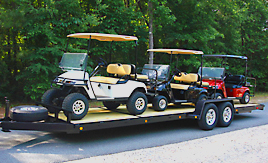 For over a decade now, Macon Custom Trailers and Golf Carts has been providing our customers with quality Golf Carts, Specialty Trailers and even Enclosed Cargo Trailers in Atlanta, and Macon, GA. When you’re looking for an Equipment Trailer in the Atlanta Area, our salesmen are known for being friendly, helpful and accommodating, and we work hard to provide the Best Deals on Used Golf Carts South of Atlanta, GA. We Also Sell Quality Dump Trailers! You will Find, Macon Custom Trailers and Golf Carts specializes in the retail sales of gently used Golf Carts, Utility Trailers, Horse Trailers, Car Haulers, Moving Trailers, Livestock Trailers, Enclosed Cargo Trailers, Flatbed Trailers, Equipment Trailers, Dump Trailers and Landscape Trailers in the Atlanta, Ga Area. We are open Monday through Saturday from 9:00 am to 5:00 pm, meaning you’ll never have to wait long for a new enclosed Cargo Trailer in the Atlanta, GA Area. We are a locally owned and operated small business, South of Atlanta, GA.
We sell a wide range of products, from Golf Carts to Dump Trailers. Our retail team is helpful, friendly and knowledgeable. We have been serving our Southeast Customers since 2004. Our prices for trailers and golf carts in Macon, GA are always reasonable. Macon Custom Trailers & Golf Carts has been visited 9,661,167 times.